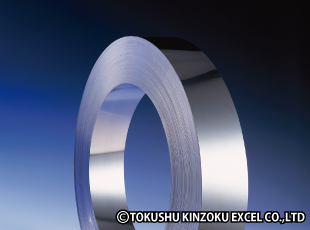 Ultrafine Grained Metal Materials | TOKUSHU KINZOKU EXCEL CO.,LTD. *Contact us if you require a thicker product. We are happy to adjust the microstructure of the finish to suit the characteristics you require. Please consult us regarding usage conditions and other issues. 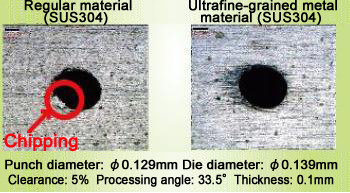 Ultrafine-grained metal materials are metal materials with an average grain size refined to around 1 μm. 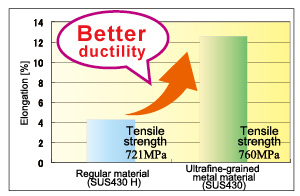 Controlling the microstructure makes it possible to improve a variety of properties such as strength and fatigue properties, strength–ductility balance, and workability. What are the advantages of a fine-grained material? 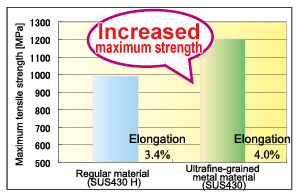 Strength can be increased through severe plastic deformation, which produces an ultrafine elongated grain structure. Increasing strength makes it possible to achieve weight savings by making parts thinner. *Graph data can be found on the Mechanical and Physical Properties tab. 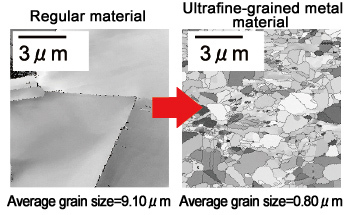 Subjecting materials to heat treatment after severe plastic deformation produces an ultrafine equiaxial grain structure that improves strength–ductility balance. This makes it possible to process the metal in a variety of ways without a reduction in strength. Improving fatigue properties makes it possible to extend part life. 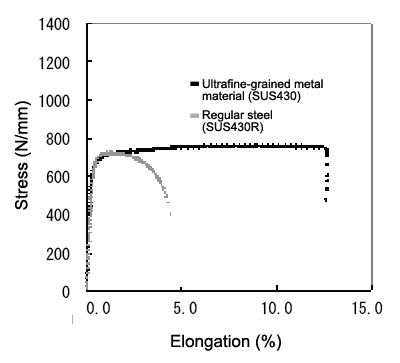 The ultrafine structure makes it possible to reduce surface roughness during metalworking processes (e.g. bending). When using normal materials with large crystal structures, after pressing, material comes off pressed sections as the product is used. 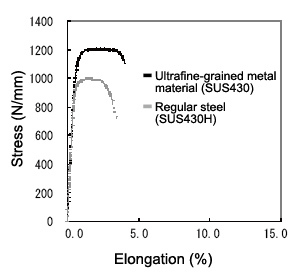 However, with our ultrafine grained steels it is possible to stabilize the contours of micro-sheared surfaces. We make products to order, and can adjust hardness as required. Our ability to produce uniform strength and thickness tolerances that are impossible to achieve using regular materials allows us to manufacture products that demonstrate stable strength in spring applications. The excellent workability of our ultrafine-grained steels makes it possible to minimize chipping during stamping to create stable stamped surfaces. 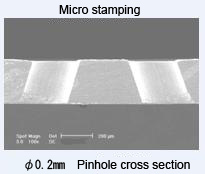 It also reduces surface roughness during bending and drawing, and can improve precision in micro stamping. We can make products with thickness tolerances that are more demanding than JIS standards, and boast the highest quality in the industry. This process requires care because it results in decreased ductility and increased anisotropy. It can overlap with other strengthening mechanisms such as precipitation and martensitic hardening, making it impossible to obtain the desired effects. Strength is equivalent to a 1/2 H or 3/4 H finish. This process is not effective for grades with a high degree of work hardening such as SUS301 and SUS304.